It is very difficult, if not altogether impossible, to get to the core of the suffering so resolutely trapped in the hearts of the characters in Rukh. No one, least of all the 18-year old protagonist, is willing to reveal more of their emotions than they feel like. You won’t find Dhruv shedding too many tears over his father’s sudden death. There is too much to be done, too many unanswered questions to be addressed, before the day is over. Don’t hang around if Dhruv’s undramatic trust with grief leave you impatient. Unlike Masaan (from the same producers as Rukh) Rukh doesn’t wallow in its griefstricken predicament. Ironically, for a film steeped in and impressed by its own ability to stay secure in its silences, Rukh is remarkably active at its core. We don’t see much of that activity on the surface where the people in Rukh see themselves as neither victims nor aggressors. A feeling of imminent danger hovers over the narrative. There are characters plotting the downfalls of others, and their own. The characters have dark secrets that they don’t want revealed. But nothing really happens. Not while we watch. In rapt attention, I might add. This is a film that magnetizes our attention not through its action but by its absence. This partiality for inaction, the deprivation of a live energy as though everything that has to happen has already happened or will happen while we are not watching, is a refreshing departure from what cinema has come to mean in present times. As Dhruv sets out to unfold the truth behind his father’s death, the narrative suffers no anxiety pangs. There are no concerted attempts to hold our attention. The pace of storytelling often slackens, bringing in characters who don’t always add up the way they are meant to in cinema about real situations, heaving and groaning to a near-halt as the rites of serendipity envelope the characters in a shroud of doubt and unexpressed fear. Dhruv’s journey is never saddled with aggravated poignancy. There is a basic bereavement in the theme which the debutant director and his co-writers (Akash Mohimen , Vasan Bala) don’t touch. Atan Mukherjee enjoys the slackening of tension as the protagonist pieces together the broken fragments of his father’s life. The editor (Sanglap Bhowmick) takes his time seeking the quitessence of hurt and healing. There is a frustrating scarcity of shared time between father Manoj Bajpai and son Adarsh Gourav. We always HEAR of their affinity, their differences and their mutual tension, never experience it first-hand. Suffice it to feel, the two actors bring a wealth of empathy between them, in spite of little shared screen space. Bajpai as the crashed-out patriarch conveys the burden of a man felled by his humanism. And Smita Tambe playing a grieving widow and a tightlipped mother is….well, grieving and tightlipped. Kumud Mishra as Bajpai’s business partner shows how much history a competent actor brings to exercize on his character even when his part is sketchily written. His colleagues at his work-place are played by equally competent actors. This is an endemic problem in Rukh. It is so deeply inured in enigma that it leaves the characters emotions largely unexpressed. Unshed tears are fine. But sometimes you just need them to moisten the spirit of sorrow that envelopes the narrative. And goodness, why is everyone so sullen in the film? Young Adarsh Gourav doesn’t get to smile even once. The actor works his way around his character’s insecurities offering us a peep into Dhruv’s soul even when he is bogged down by his inability to connect with the outside world. 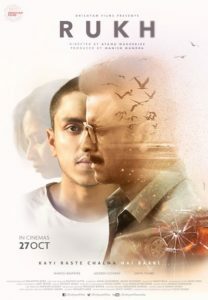 Though Rukh is finally felled by its characters’ frustrations it is a brave effort to dispel with the belief that all cinema about sudden deaths must be loud and dramatic. Rukh takes the opposite route, happily allowing us to strain to hear the sound of the young protagonist’s broken heart.